The songs below were written twelve years ago as part of my Sermonette Collection. Finally, on 9/11/01 my prayer was to be answered. On that day we will all never forget, I was heading for the recording studio to meet with Grammy award winning musicians, that God had also blessed me with....when I turned on the radio and heard what horror was happening in New York City and Washington, DC. I couldn't believe what was happening! It was all so frightening! By the time I arrived, the musicians were loading their equipment back into their Vans to go home. None of us, like you, knew what to expect and our families might need us. Needless to say, we canceled hoping to reschedule in October. However, God opened a new appointment up the very next week. 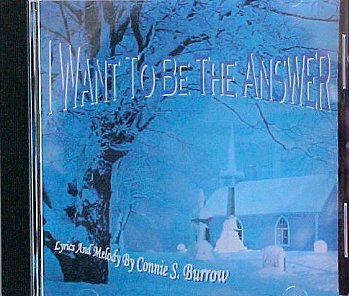 Now...more than ever, the featured song in my collection, "I Want to be the Answer", has even more meaning for me. It is now so appropriate for that day and even still this past year with all the catastrophes and storm damage in many places around the earth! The soundtrack was finally made, and later wonderful local groups and gospel singers donated their time and talents to help with the next phase of a Project God started through me many years ago. Today, I have no idea of what will become of these songs or this CD. It may be just to put on this web site in hopes it may bless others as these songs have blessed us. I only know its been awesome to watch God in action, bringing all these phases into manifestations over the years. If no other group or singer EVER records any of these songs, its been such a blessing to see God move and work in my life! Praise you Lord for all you've blessed me to do for you. Please if you will, stop and take a moment to listen to the messages in these songs. I pray you are blessed by them all, for I have waited a long time for this day! If you are interested in recording any of the songs playing on the web pages below, please Email us for more information. My husband, Olyn and I want to offer a very special "Thank You" to all the wonderful people who were involved in making this Dream become a Reality. Bob & Margie...you'll never know how much we appreciate you for producing this final CD. And to all the Singers for your prayers, support, time and talents. I want to especially "Thank" my husband, Olyn for believing in me and for being so generous with his financial support, encouragement and love. And to our families for your prayers and enthusiasm, we thank you all. Nothing is Impossible to them that believe! Please take a moment and let us know you were here! We would love to hear your comments and encouragement and especially your prayers. All Lyrics & Melodies on this Demo CD are Registered & Copywritten for protection by law 1993. Please do not use or record without permission of the Author's Consent.